Tallahassee Reports has determined that Tallahassee City Manager Reese Goad leaked the city’s report of the football skybox ticket investigation to Tallahassee Democrat publisher, Skip Foster, before the city’s ethics officer was aware that the report was completed. In addition, Goad chose to provide the report to Foster and no other local media outlets. The preference shown by Mr. Goad to the Tallahassee Democrat comes on the heels of a TR investigation that revealed Tallahassee Mayor Andrew Gillum met with Foster and successfully convinced the publisher to crop an embarrassing picture in return for an interview. Julie Meadows-Keefe, the city’s ethics officer, admitted to the Ethics Board at their last meeting, on April 17th, that she learned about the ticket report through a Tallahassee Democrat story. The Ethics Board had previously referred the ticket issue to Goad for further investigation. 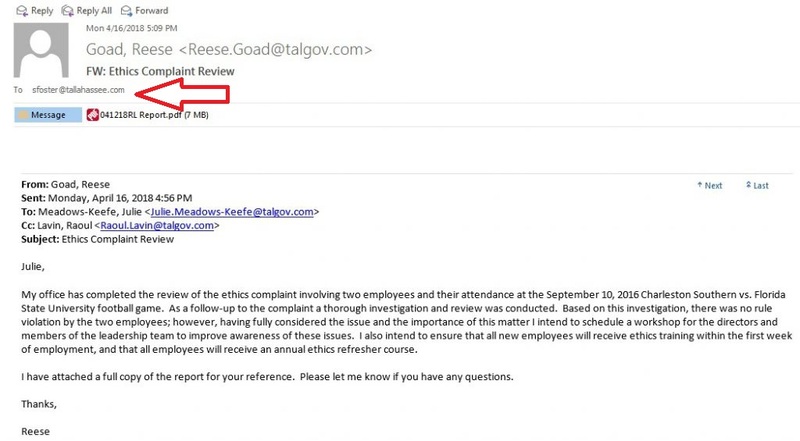 A few days after the Tallahassee Democrat published a story about the report, TR requested emails sent from Reese Goad’s email account on April 16th. The emails show that around 3 pm on April 16th, Goad notified City Commissioners and the “Executive Team” that report was completed and that no violations had occurred. At 4:56 pm, Goad sent the report to Meadows-Keefe. The email is shown below. At 5:09 pm, just 13 minutes later, Goad forwarded the Meadows-Keefe email to Skip Foster, without comment. See red arrow added to email below. At around 7:15 pm on April 16th, Tallahassee Democrat reporter, Jeff Burlew, published a story about the investigation with a copy of the report. There was no press release or formal release of the report to other media outlets. These findings coupled with the Gillum negotiation with Foster raises questions about the relationship between the City of Tallahassee and the Tallahassee Democrat. What other favors have high level officials done for the Tallahassee Democrat? Have city officials received any favors in return for giving the Tallahassee Democrat preferential treatment? Is the Tallahassee Democrat “sitting” on other information that may be damaging to city officials? 6 Responses to "City Manager Reese Goad Leaked Ticket Report to Skip Foster, Ignores Other Media Outlets"
Goad is so lame in his attempts to follow through with the corruption of his predecessors there at COT. I mean Goad’s not even good at it at all. The FBI should have a higher level of punishment for someone who steps into a known corrupt situation, does nothing whatsoever to make the situation more honest in the public interest, and on top of all that is not even good at being bad. Goad did you learn nothing from watching the corrupt Fernandez, Favors, and all the others? Think about it this…Tallahassee Reports and Tall. Demo were both sent the notebook Rocky Hanna put together to dirty up the former superintendent. Tallahassee Reports did not run with it, TD did and ran 50 articles! Rocky admitted he fabricated the entire thing and Tall. D Demo never corrected a thing they wrote. Truthful reporting is a concept that the Tallahassee Democrat does not adhere to or believe in. That’s because they’re not about the truth. They’re about separating you from your money. Fortunately, no one is fooled – their stock is down 72% in the last three years! The end is near for the Fake Newsocrat. Driving by in the north bound lane of the Magnolia Street location of The Democrat yesterday I observed an unobtrusive “space for lease” sign. Now it’s not right in front of the business where you are going to be looking for it. It’s been strategically placed near the north end of The Democrat’s property. Is it the restaurant on the corner trying to lease space? Or maybe one of the spaces in that entire warehouse – tattoo parlor business complex north of the RR tracks? Maybe. But the way I saw it Saturday afternoon, the sign looks to be just south of the RR tracks, and on the north end of The Democrat’s property. I would think The Democrat has had unused space, most likely filled to the rafters with Malcom Johnson’s old manual typewriter, carbon paper, and other obsolete items, junking up their red brick building for many years now. And cleaning it up plus leasing space out makes economic sense as they slide into irrelevancy. It would be kind of poetic justice to see The Democrat and a tattoo parlor working together out of that big old red brick building. Or just bulldoze the property and park new Ford F150’s and Lincolns there!!! I believe they’re leasing the south lot to the Ford dealership next door – which stores their cars there. At least they did while the dealership was renovating. Bottom line: the two presses are the only reason they haven’t sold. There’s no other presses like them (Metro & Urbanite) for 2-3 hours in any direction. Plus, they’re used for commercial jobs, so they make money when not printing the next days bird cage liner.